Sears Roebuck terminated their big catalog in the US several years ago, but the catalog is still going strong in Canada. It is currently the largest mail-order catalog in the country. At the same time, Sears is also a big retailing presence in Canada with 110 retail stores and 1,800 catalog agents. Last year, these retail stores were in trouble. Profits in 1995 dropped 73% over the previous year. In June 1996, Sears eliminated 1,200 jobs. Things did not look good. With retailing in trouble, Sears looked to the catalog business to pull them out of their hole. 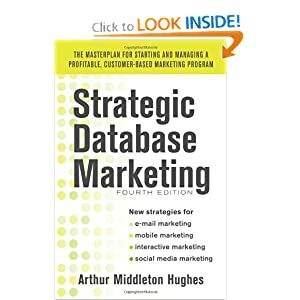 In 1995, Sears hired Fred Hagerman as list manager for catalog marketing with a mandate to implement a new marketing database for the catalog business. Prior to joining Sears, he was manager of direct marketing with Info Direct in Scarborough, Canada. When he took a look at the Sears database, he knew that some changes had to be made. The Sears database was maintained on a mainframe, using thirty year old software. It took 120 people to do the manual file maintenance. The file was loaded with duplicates. The file was not on line. It could be accessed only through hard copy reports that took a week to produce. Fred decided to make a business case for a new database system with modern software, and on-line access to do counts, reports and selects. He showed that he could pay for the system by just finding and eliminating the estimated 10% duplicate names on the system. Saving the cost of ten percent of the catalog mailings to an 11 million name database amounts to a lot of money. He set up a system whereby the data from the mainframe can be viewed by a client server through a simple spread sheet. The new system permits looking at circulation, media, performance analysis, growth and response rates, and tracking of promotions. The 11 million name database can be updated weekly in about two hours, producing all sorts of reports. Sears still uses the IBM mainframe to hold all their data. Their three call centers take more than 18 million calls a year. Data from these calls and all retail and catalog transactions is kept in the database. The mainframe sorts the transaction data and summarizes it for the client server. The client server software system is called Archer, developed by Retail Target Marketing Systems. It is a marketing selection tool that is used to study the 189 RFM segments into which customer are now divided. Archer helps Sears fine tune their selections. The data is contained in four basic tables which can be accessed from a Windows environment. The system is plugged into a LAN so that a large number of Sears marketers can access and play with the data. The marketers can use macros and sorting on their spread sheets to manipulate the customer data in a wide variety of ways. Before Fred arrived, active customers were defined by Sears as people who had shopped with Sears in the last 12 months. During the previous decade, the active file had been going down by 3% per year. Fred had to stop the decline. His first step was to find and remove the duplicates. Next, he stopped the practice of dropping people who had not bought in 12 months. Each year, Sears was losing valuable data on people who hadn’t purchased in a year. It was very difficult to maintain or build any kind of relationship, or any kind of long term learning with customers when you dump their data after a year. Fred’s goal was to understand customer segment behavior so that Sears could begin retention activities, reactivation, and catalog cross shopping promotion. The old system classified customers as active, inactive, one order customers and two plus. It was not very informative. Planning was aimed at knowing how many customers Sears had, and what they were doing. They developed an RFM model, based on the customer’s lifetime value which they spent on catalog items. They created 189 RFM segments. The segments tracked response rate, average order, and dollar per book across all 189 segments for every one of Sears 13 catalogs. All the variable costs of each promotion, whether it is a catalog or a direct mail promotion, can be applied to each of the 189 segments to forecast segment profitability. This tells Sears whether it will be profitable or not to mail to each segment. They can understand the ramifications of what they are doing for each major promotion. They can accurately forecast what sales they are going to have at the end of the year. Sears marketers tracked customer migrations through all the segments on a weekly basis. They were able to learn where the customers are coming in, how they are moving around in the file, and what their performance was. They were able to forecast an annual file growth projection on a weekly basis. They were able to know whether they were growing or shrinking, and where they needed to worry and re-plan. If a Sears customer had a lifetime spending of $2,500 and had made a purchase in the past three months, the customer would be in a specific segment. If there was no purchase in the next three months, the customer would move to a lower segment. Using the new system, it was possible to do stimulation activities. They could identify Sears customers who left and start reactivation programs. In addition to RFM, they also developed a predictive model. Using both, they could see real value in both. If business is starting off below the marketing plan, with the new system, Sears can readjust and re-allocate marketing expense to try to deal with it. Customers can be compared not just by RFM segment, but also by media. Do people perform better in a wish book, a sale book or a spring and summer book? What kind of merchandise do they buy? Do they buy just men’s clothing or women’s or children’s? Do they buy appliances through the catalog? They can also look at segment payment methods: Sears credit card, third party card, cash and how performance differs among them. They can also look at performance by catalog distribution method—there are eight different methods. By tracking sales in the past, Sears knows that their half life is 20 days after a catalog is mailed. They can track the entire success of a book by sales made during the first 20 days. What has been the payoff for the investment in the database? Sears found that sales parallel customer activity. Sales are up also. Every single media but one, after the database kicked in, is up. The Fall and Winter catalog had a 10% increase in sales. The Fall Values catalog had a 7% increase. The first reactivation book went out in March 1997 to people who did not receive the regular catalog. Break even response rate was 3.5%. Actual response rate was 4.5%. Sears reactivated 12,000 customers, and made a profit while doing it. Integration of data. The goal now is to integrate the customer information and understanding of their behavior by putting this data on the screens at the telemarketing call centers so that Sears can start target marketing program scripts right at the beginning of calls. They also want to put this information onto the screens of the 1,800 catalog agents who talk to the people when they pick up their packages. They want to take competitive advantage of their data to build relationships that will surprise and please the customers. Migration to Retail Stores. Soon Sears wants to migrate the database to the retail stores. Customer data can be linked to the point of sale system. When you walk in to a Sears store and pay for something at the cash register, you can be treated in ways that are distinctive to you. Corporate Picture. Sears Canada wants to provide a corporate picture of customer behavior. Sears is really three companies: a credit organization, a catalog organization and a retail organization. The customer, however, sees Sears as one company. There are some customers who only shop catalog. Some only shop retail. Some shop both. Typically a catalog only customer may spend an average of $100. A retail only customer may spend $165, but a cross shopper who uses both channels spends $235 in retail. A cross shopper in catalog will spend $140 in catalog instead of $100. To get the whole picture, a cross shopper who buys in both markets spends $375. These cross shoppers are Sears core customers. They represent 30% of the entire database. Sears goal is to market to these valuable people. To do this, Sears has to change the corporate culture. Sears wasn’t built to take advantage of this situation. The goal is to change this picture very soon. Specialty Programs. Sears now has a solid business case for a reactivation and a prospecting book. They are working on a retention model that will be tested soon. Distribution Management. Sears has eight different distribution methods and 13 catalogs. They are building a distribution table to support and manage the distribution to reduce the cost. What if strategies. Sears now has an improved testing capability. At any given catalog mailing, they can do up to 99 different tests. The most they have done so far is about eight. They have the capability to start to develop new catalog media based on the data available on the 11 million names in the database.